It has been a while seen I wrote here. 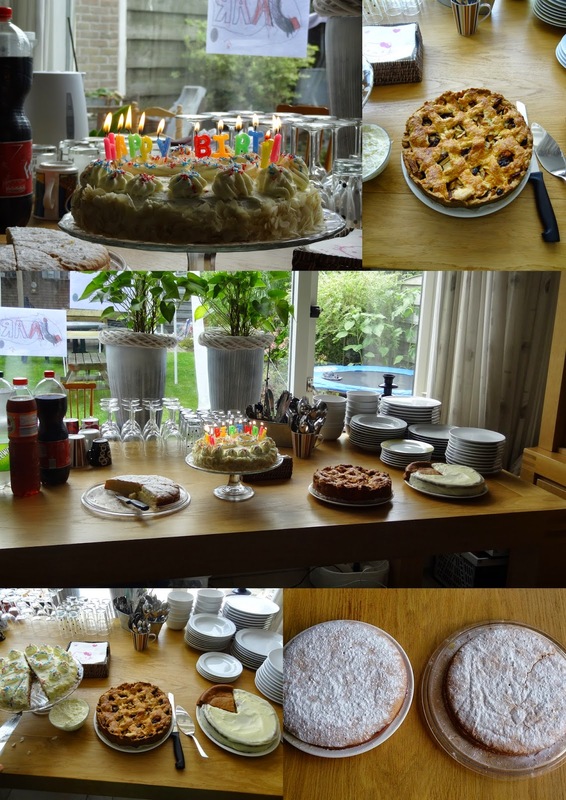 But let talk about the party..
As my birthday is togheter with my 2 nephews, I had my party yesterday. Wednesday we came back from vacation, two day's of cleaning it all, and then Friday I was too see the whole day in the kitchen. As Hubby know I wanted to bake a lot of cakes as a big surprise he gave me a new mixer, and I love it .. It´s so handy, and my cakes-pie´s are even more tasty and faster done. Then saterday morning did the last apple pie. And then hubby told me to hurry up as he had a surprise for me.. But first the shower, putting on my party dress. Then not much later, hubby told me to go to the door, and who was there??? Sweet sweet Valérie and her Supperhubby came all the way from France to celebrate my birthday with me.. I didn't know a thing.. I think she can still hear me screaming in her ear.. I jumped out of the door, run too her, jumped in her arms..
Look at us.. so pretty!! Me just after blowing out of my candles..
Wanne see the other pie's?? I made a whip-cream pie, a apple-pie, a carrot-pie, and 2 miserable..
Then for diner I made some things too. I made so many things for Diner... I got many compliments of how much and how great it was..
isn't that right Valérie and Superhubby??? I got many beautifull awesome gifts. 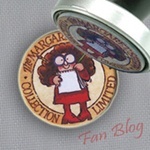 Thank you so much Marion, or the sweet card and magnet.. it's always so awesome, how you find teh special things. Then that morning Valérie send me a message if I got her gift, because there was also something in there for Kira.. know I didn't because she had it with her a few hours later..
Valérie made teh awesome sweet Little red riding hood pillow, as she know I love her and the pattern.. and look at that finish off.. But look even closer you see the little doll??? It is made by her SuperHubby..
Really need to make better pic's.. in the basket are cookies I think 2 mm big.. really awesome.. they made it speacially foe me in a bit of a secret. owke they shared it with two other lady's, who know about it all... and also kept there mouth closet... :((((( he Rita and Nia???? I;m really really happy with it..
A awesome garden scrapbook and a magnet clip..
the book is totally made by her.. it's really awesome.. Soon will show it totally!! And that was not all..
Noah got a very COOL angry birds Starwars T-shirt from Rita, and a Lego Starwars package from Valérie and Superhubby. Kira got a wallet, a book and two hello kitty hair clibs from Valérie and Superhubby en a hello kitty book and pencil from Rita.. Girls togheter with Nia, you made my day so darn special..
spoiled me so much.. and the kids also.. so very sweet. I know they loved it very much., I love it very much..
As you all can see my birthday was one to remember.. I'm now off to sleep, today went to the party of my nephews.. also awesome day, I had to stand on the table with the little boy's, and they all sing for us.. The table did not broke thnakfully... lol.. I'm tired, because of the awesome day yesterday, I didn't let all night, hope to do that tonight!! I am in awe at all the goodies and wonderful dishes that you prepared for your celebration--you must have been up all night cooking in the kitchen. Everything looks scrumptious. And I love the photos of you and the kids and you and Valerie--everyone looks so happy and excited. Dear Annette--I wish you every happiness as you enter your thirties... You so deserve it and I hope it will bring you even more love and laughter than you already have in your life :) Sending a big birthday hug your way!! Happy Birthday! The big 30 ... a real milestone. Seems very young to me but it always takes time to adjust to the idea of a new decade! What wonderful surprises you had to celebrate. And you are one wonderful cook! Best wishes for a great new decade! Happy Birthday sweet lady , sounds like you had a gread day ,how lovely to have your friends there. Wishing you a wonderful week . Happy birthday Annette!! The big 3-0 is definitely nothing to worry about! In a couple of years I'll be at the big 5-0....I'll let you know what that's like!! What a wonderful day of surprises! Having Valerie and Superhubby on your doorstep must have been a nice shock, I would have loved to have seen the look on your face!!! 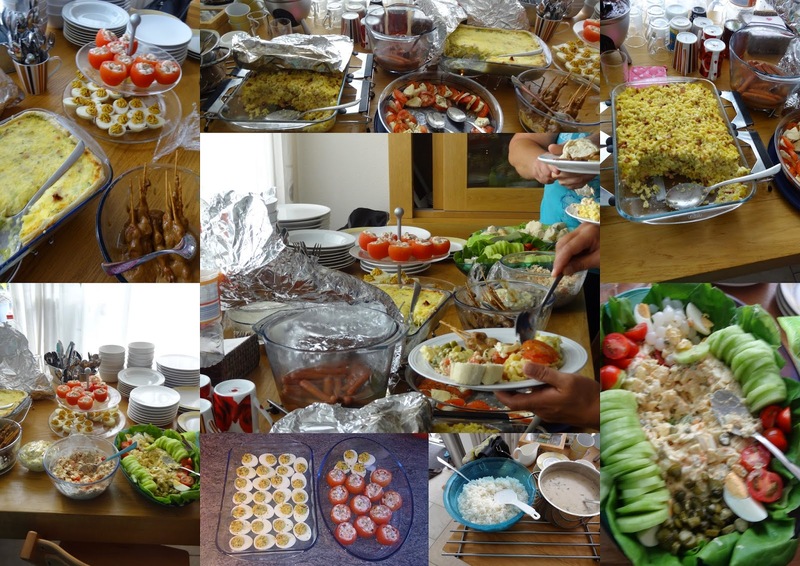 Well done for all the food you made, it all looks spectacular! So many beautiful gifts! 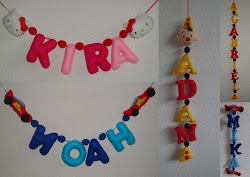 Handmade makes them more special, one-of-a-kind things that no-one else can have. Wonderful memories that will last a lifetime, you won't forget your big 3-0 in a hurry! Happy Happy 30th Birthday! Looks like you had a wonderful day, the photos are so sweet, and your party food looks delicious! Gefeliciteerd! Klinkt als een leuke verjaardag. OMG! I can't believe YOU are the Petite Anne Valérie was always on about!!! :D So glad I found you thanks to my hubby (Lego Caveman). Happy happy 30th..Annette! Such a lovely surprise from your friend and all the lovelies!! Happy to hear you had a great party. So many yummy's you've made too. I am sure you're up all night for the preparations but it's all worth it when people appreciates it. This post really make me smile and touched my heart!! What an awesome surprise it must have been to have your blogging friend on yourdoor! I can imagine how happy yu were.Our stitching friends are all so dear to us even thoughwe would know them only via internet!! Indeed it was a very special day, a great birthday day! We had a lot of fun, jajajajajaja !!! Thank you both for your welcome in your home ! Happy belated birthday - looks like you had a great party! Your craft work is beautiful. What an amazing birthday my dear Annette!!!! Happy Belated Birthday! You are so lucky to hang out with Valerie!! Beautiful photos of you and your children. You are so pretty!! Lovely cakes to eat too!! xoxo! Annette! OMG.... what a fantastic surprise for your birthday :o) Seeing Valerie and Superhubby would be the icing on the birthday cake for sure! It looks like you had the most amazing 30th birthday party! Happy birthday, a little bit late, but still from the heart! what a big surprise along with a lot of gifts!! The pies, I had to close my eyes... they seem delicious!